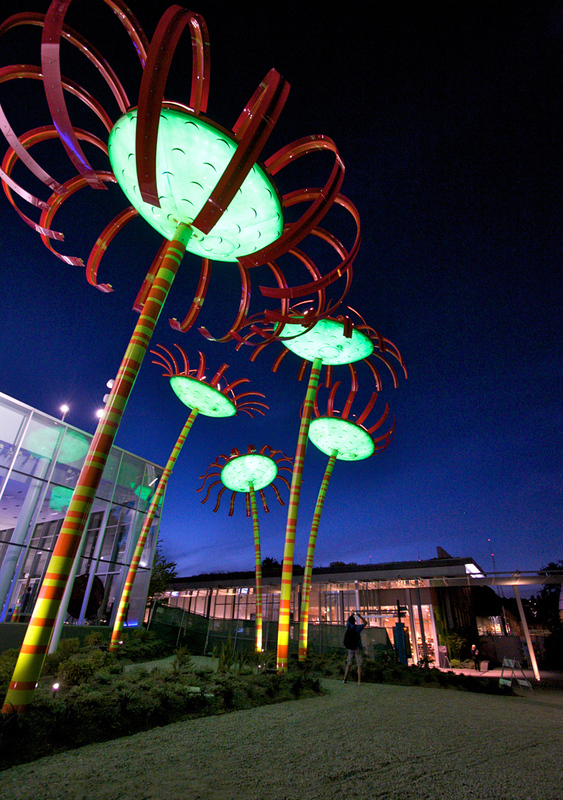 What's the best way to brighten up a city like Seattle at night? Street lamps, of course, but not just any kind. 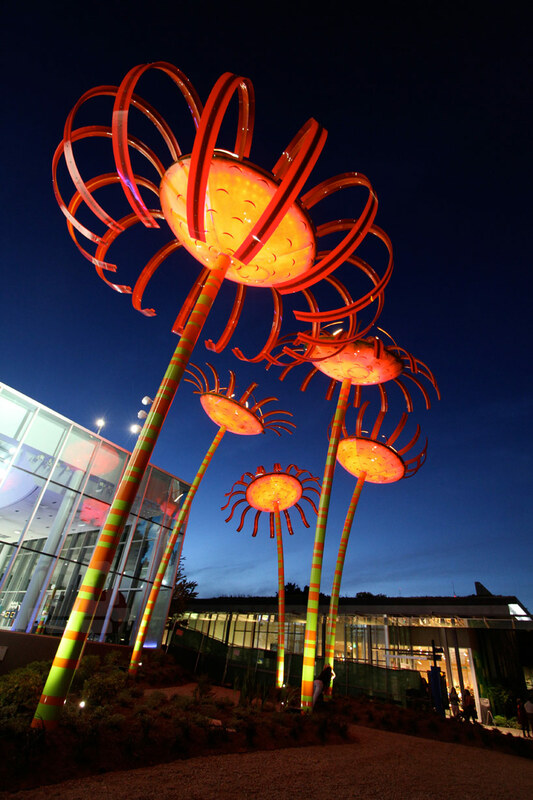 According to Design Boom, the city recently installed local artist Dan Corson's "Sonic Blooms,&quot which are enormous solar-powered flowers with glowing petals that were commissioned by The Pacific Science Center. 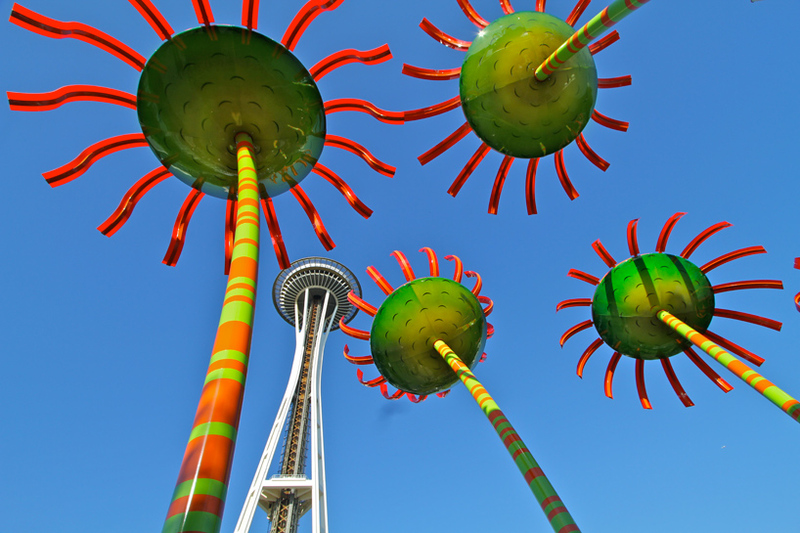 The project had added funding from the Seattle City Light's "Green Up" program, which allows citizens to pay slightly higher bills to promote more renewable energy systems. Towering at 40 feet high, these lamps have photo voltaic cells on the top that collect energy from the sun and then reflect it back out at night with patterned LED lighting. These astounding installations are not just lighting the way along citizens' walks. Passersby trigger sensors inside each flower to set off a cacophony of harmonic sounds for a unique and dynamic experience. 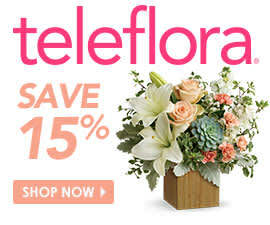 This interactive feature works both day and night, and the choir of tones differs between every bloom. In an email interview with The Atlantic Cities, Corson noted that the tones range several octaves from the key of D minor to D major, and some of these looped samples have more vibrato than others. Already, people have been inspired by the potential of the auditory component. Corson revealed that he's had people approach him with ideas for a dance in the space that would correspond with the music. This isn't the first highly unique botany-inspired project from Corson, either – The Atlantic Cities reported that his previous work has included a lawn full of green lasers in Florida to street lamps in Portland that look like the plant from Little Shop of Horrors. According to the news source, Corson originally wanted to name the piece "Humming Heliotrope" in reference to its auditory feature. There's more to the alternating green and orange stripes on the stalks than meets the eye. These stripes contain a coded message, but Corson won't reveal what's hidden. Corson explained to The Atlantic Cities that he researched Morse code for inspiration when designing the stripes on the blooms' stalks, and eventually decided on barcode-like stripes that would add an air of mystery to the project. "I liked being able to make a puzzle that did not look like a puzzle and also encourage kids of all ages to explore different layers of the project," he told the news outlet. "It will not be easy but with a bit of sleuthing, it should work. He initially wanted one flower lamp to be the "lead singer" for the other four flowers, which would self-activate and hum to provide backup sounds. After determining that this wasn't the best idea from both a sight and sound perspective, he collaborated with a local sound and electronics engineer to design a better system. He told The Atlantic Cities that while he didn't select one specific flower as the inspiration for his project, he did base their form on a particular stage of the Australian Firewheel Tree's development. As Seattle is notorious for overcast weather, the tips along the lamps' acrylic petals were specially designed to provide a boost of luminosity on gloomy days. 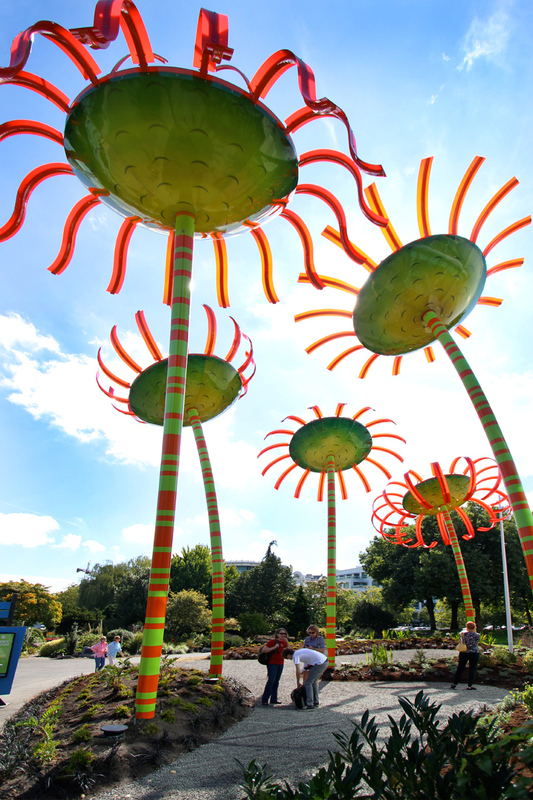 Despite the fact that "Sonic Bloom" cost a considerable $300,000, the art piece may be able to garner further support for solar energy, which is something that Corson is committed to spreading. "There's a myth that solar power won't work in Seattle," he said, according to The Seattle Times. "But even on the cloudy days we get a lot of, solar does work."